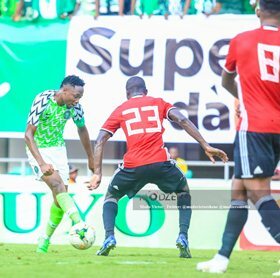 Super Eagles captain in their last three Africa Cup of Nations qualifiers, Ahmed Musa, has said that one of the two options for Odion Ighalo was to return the pass back to him or attempt to score in the moments leading up to the winning goal scored by the three-time African champions against Libya on Tuesday evening. With nine minutes to go, Ighalo scored his fifth goal against the Mediterranean Knights in the space of three days when he produced a sublime finish after slicing past two defenders. Musa's pal and international teammate Abdullahi Shehu was omitted from the Super Eagles traveling party to Tunisia after picking up an injury last Saturday in Uyo but the former Leicester City striker has brought positive news on the health of the Bursaspor defender. ''I spoke with him on the phone this afternoon, I think he will be out for just ten days, and then hopefully by next week he will be back,'' added Musa. Ighalo and Musa are Nigeria's leading marksmen in Africa Cup of Nations qualifying with six and two goals respectively.